a little spooky family memorabilia. made for a surprise Halloween Birthday Party for my grandmother in 1926. These are their engagement photos from around 1906. He was a printer, so I have several pieces of his work. I love the little pumpkin and black cat graphic that he included. sometime in the late 1880's or early 1890's. She was around 40 when my dad was born in 1929.
so I have a little childhood nostalgia for the holiday. 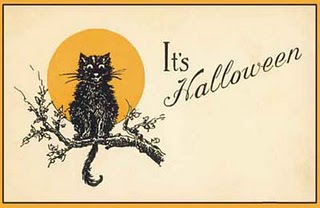 piece of Vintage Halloween ephemera. Oh my goodness, what a fun invitation! Creative Grandfather to make it so much fun! Lucky you to have it for you keepsakes! Enjoy your day and big hugs! Now that is COOL! Such a treasure!! What a wonderful family piece to own....I love all things old and vintage but family pieces are elevated to a whole different level. Looks like creativity runs in the family! Oh wow Debra, what a sweet piece of family history! It sounds like your grandfather was something of a romantic. He threw a party for your grandmother, AND he wrote that little poem! I wonder if they wore costumes? Thanks so much for sharing this! How sweet that you still have a copy! I love the font. And born on Halloween! My youngest would have loved that, she decorates everything in her house with skulls! Even has a real skelton in her house, minus the head! Ah! I love it!!! That is SO cool!!! What an amazing piece of history and a family heirloom! Hi Debra! Love this! How cool to have this in your family! How neat that you still have that invitation, Debra! I share a birthday with your grandmother. Your Grandfather must have been the coolest guy ever Debra!!!! What a wonderful treasure to have! I loved your chippy white post my friend! How fun!! He was a handsome devil, wasn't he? I wish my husband would do something like this for me! Ohhhhhhh Debra.... Those old photos... The vintage type font... Has me thinking of mysterious "Spirits" with hidden secrets!*!*! Thanks for adding an interesting twist to spooky halloween!*!*! I Love those little pictures and in the locket. I like them especailly because they are your families. Nice , party invite also. what a treasure for you. That is totally cool. How special to have this and that it is from your family, even better. Thank you for sharing. what a great grandfather, so sweet he wrote this poetical invitation,to celebrate his wife. And you are just so lucky, to still have this in your possision . You almost expect to hear an evil "bwaahahahaha!" in the background....! lol! Your Grandfather was very creative! I love the poem and the artistic touches on the invitation. What a wonderful items to have of your grandparents. I would treasure them forever and ever. Love your photos, they are always so beautiful. I too linked on to the Vintage Halloween party over at Anything Goes! Happy Fall my friend!